The Selecter (featuring Pauline Black and Gaps Hendrickson) have just posted preview tracks for their new studio album 'Made In Britain' which is out on September 1st. 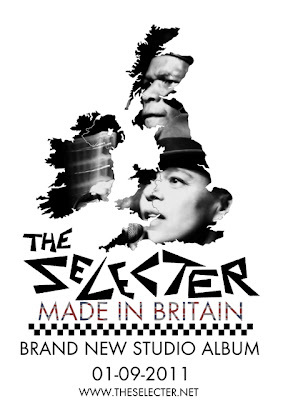 The album features 10 tracks that mix ska, pop and reggae with lyrics that reflect the social and political issues confronting Britain’s new multicultural society in 2011. The album includes the first single,'Big In The Body-Small In The Mind' which was released on May 30th and reached No.1 in the Amazon hottest new reggae releases download chart. The song is a re-working of Woody Guthrie’s 'All You Fascists Bound To Lose', and helps to set the band's agenda, which notes that racism is still on the rise in Europe - a statement sadly vindicated by the horrific recent events in Norway. The band has also recorded a ska cover of Amy Winehouse's 'Back To Black' as well as re-recording 'They Make Me Mad' from their very first album 'Too Much Pressure'. Below is a great live performance of the band performing 'Back To Black' at a show in London shortly after Winehouse passed away in late July.